I had intended on getting up early and walking around the square outside our hotel because I knew Tammy and the boys were going to sleep in. Our late night out kept me from getting up as early and I had wanted, but I still was up and out on the square around 8:45 Saturday morning. The square was already bustling with a Farmer’s Market where people were selling fresh fruits, veggies and other homemade items. I walked around and briefly checked out the items as I walked to the stores I had wanted to check out but not many were opened yet. Now, I don’t drink a lot of coffee, just one cup each morning, and my coffee is hardly coffee, more like warm chocolate milk with all of the creamer and sweetener I put in them. So going to a coffee shop to order coffee isn’t something I look forward to doing. But since I knew Tammy would want coffee when she woke up, I braved it and went into a local coffee shop. It took me about five minutes to figure out what I should get and even had to let a couple of other people order before I was able to get mine straight. I got something with peanut butter, chocolate, coffee and ice for me and a white chocolate mocha for Tammy and headed back to the hotel. I rounded up the crew and we headed out to do a little shopping before checking out the battlefields. I purchase a couple of Civil War bullets at one of the shops, a book of compiled stories from people who saw soldiers die and four books of letters written and sent home from soldiers. The last place we went into was amazing. It had so many Civil War artifacts and mini-recreations of the battlefields that you couldn’t help but feel all of the pain and suffering associated with the time. The boys, who were already bored with Gettysburg, missed the last store because they had decided to sit in the car and wait for us. We began our tour of the battlefields later than I had hoped, I knew we weren’t going to be able to see everything. We started out by going into the National Cemetery where there bodies of soldiers were buried, some from the Civil War. The cemetery was dedicated by Abraham Lincoln and was the site of his famous Gettysburg Address. My heart broke as we walked but so many “Unknown Soldier” tombstones because all I could think about was how sad it would be to never know what happened to your loved one that had gone off to war. The weather was beautiful and because of the gentle breeze that would frequently blow, we didn’t’ sweat too much. We left the cemetery and walked across the street to the top of Cemetery Hill where we could look across a good part of the battlefield. It’s hard to describe the feelings I had as I walked around on the same ground where men were fighting and dying for their beliefs in what their side represented. We toured several other sights and got to see a group of Union soldiers performing maneuvers in a field for a group of people. They demonstrated how they would load and shoot their guns then pull back for the row of men behind them to shoot and vice versa. After taking pictures and soaking in the sights from the lofty perch, we went down into Devil’s Den. If I’m remembering everything correctly, this is where the Confederates were as they attempted to take out snipers in Little Big Round. Again, people were walking around the same rocks that had been covered in blood and death. I had seen a picture of Devil’s Den and wanted to find the spot where the picture was taken. The reason I wanted to find it was so I could recreate the shot with Jake and/or Ben. 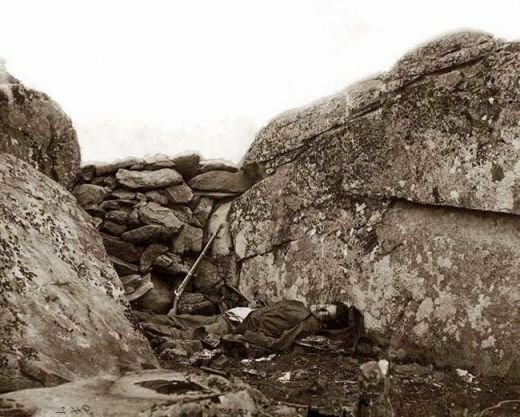 In the picture, a Confederate soldier is seen lying dead behind a rock wall. It wasn’t the original spot where the soldier had died as the photographer had moved the body to “pose” for the photo. Since I had the picture in hand, we were able to find the shot and position Jake. The photo will have to be posted later because I’m not able to get it on here. Devil’s Den was our last stop in Gettysburg because we still had a four-hour drive to Williamsburg. I left wanting to return not just for the ghosts, but to experience the battlefields as they were intended. I was disappointed and saddened that the boys weren’t as excited about Gettysburg. At one point Kevyn had said he was more into World War II stuff. I told him that I couldn’t take him to any WWII spots and that this war was found on our soil. Boys were lying about their age so they could fight in the war. People were willing to fight for what they believed in and if that meant dying that was fine. While that’s a sad thought, it’s not nearly as sad as what all of the people went through during the Civil War. We drove through the suburbs of Washington, D.C. and stopped at a Chick-Fil-A for our first “fast food” meal of the trip. We ended up making it to Williamsburg around 9 p.m. Saturday night. After I checked in, I was approached by one of the customer service agents who tried to get “an hour of your time” because we are staying at one of my Dad’s timeshare locations. I told him I had people in the car that really needed to go to the bathroom. I told him I’d try to come back (NO WAY) and we were off to our room. 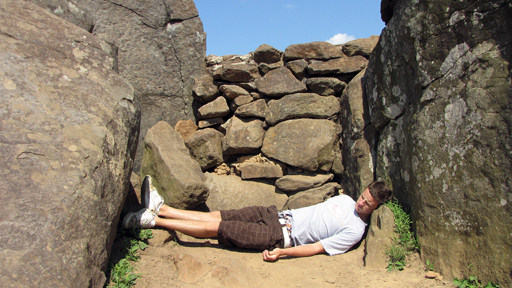 Gallery | This entry was posted in 2009, Travel Logs and tagged 2009, Devil's Den, Gettysburg, Travel, Travel Log. Bookmark the permalink.